All who know the story of The Lord of the Rings know that without Sam Gamgee Frodo Baggins could never have reached Mordor so that, in other words, Sam carried Frodo to Mordor. But this week we are going to think about the way that Frodo carried Sam to Mordor and we will show how Sam could never have made the journey he did without Frodo or become the person that he did without him. It was Sam’s relationship with Frodo that enabled him to grow into someone who could inhabit this story that is far too big for him even though he is never really aware that this is what is happening to him. In the very first scene of The Lord of the Rings we meet Sam’s father, Gaffer Gamgee, sitting in The Ivy Bush on the Bywater Road talking over the news with the assembled gathering there as the Shire prepares for Bilbo Baggins’s great party. As they talk the Gaffer ruminates aloud over his anxiety that Sam is being taught how to read and write by Bilbo and that he loves to listen to Bilbo’s stories. Sam’s love for the tales he has heard will take him straight to Mordor but there is another love that will take him there too and that is his love for Frodo. It is when Sam hears that Frodo is leaving the Shire that he chokes and so gives away his hiding place outside the window. It is his love that first awakens his imagination in a way beyond anything that the Gaffer could ever conceive and would fear to do so and it is through the awakening of his imagination that Sam longs to see and to know for himself. This is what I meant when I said that Frodo carries Sam to Mordor. This is what happens when one person awakens the imagination of another. The Gaffer, fearful of the unknown, deliberately tries to keep his son within the known world of cabbages and potatoes. Bilbo, and then Frodo after him, takes Sam into an unknown, fearful and wonderful world. I look back now with the deepest gratitude to the teachers who read wonderful stories to me, who introduced me to beautiful music and who taught me wonder. But even as my heart was opening to beauty I was already aware that most of my playmates were making different choices. And who can say which was the right one? Sam’s drinking partners in the pub laugh at his dreaminess and so it is that they never go to Rivendell; but then neither are they attacked by Ringwraiths or, wracked with hunger and thirst, stagger through the hell of Mordor to the fiery mountain. It is both a wonderful and a fearful thing to have our imaginations awakened. And it is both a wonderful and a fearful thing to truly love another. Sam is carried to Mordor by Frodo. His life would have been safer but also poorer if he had stayed at home. If we choose safety then we must also choose poverty. But if we choose wonder then we must also choose fearfulness. So Saruman is defeated and Pippin turns to Gandalf and asks, “What will you do to him?” . And so we see once more the contrast between Gandalf and Saruman, the one who lives “in terror of the shadow of Mordor,” yet “will not serve” but “only command”. In previous postings I have compared Saruman to Adolf Hitler, not suggesting that Tolkien based Saruman upon Hitler, but arguing that spiritually they are kin. I will offer one more character to whom I believe both to be related and that is the figure of Satan in Milton’s Paradise Lost. “Better to reign in Hell, than to serve in Heaven,” is now one of the most famous lines from Paradise Lost and it is perhaps a sign of our time that many believe such a sentiment to be praiseworthy, a declaration of freedom from a divine tyranny that would keep us infants and deny us the divine fire as it did to humankind before the heroic sacrifice of Prometheus. Praiseworthy it may be to stand in defiance of tyranny, whether such be divine or human, but in creating the character of Saruman and the character of Gandalf, Tolkien shows us both the true nature of divinity and the defiance that seeks to reign in despite of the majesty of God. All who have read The Lord of the Rings will have noted a marked absence of divine intervention in the story unless we count Gandalf’s comment that Frodo was “meant to have” the Ring. Even Frodo is given freedom either to accept the task that is given to him or to reject it and the task is not at its beginning to take the Ring to Mordor but only to the temporary safety of Rivendell. Those who have read The Silmarillion will know that Tolkien had a sense of divine purpose in the mythology that he created but they will also know that Middle-earth is from the very beginning a sphere of freedom and that the divine purpose is always shrouded in mystery. Tolkien never tries to explain the mystery of the immortality of the Elves nor the mystery of human mortality and although he shows in the myth of the Music of the Ainur that there will be a wonderful conclusion to the story he never tries to tell us what it is. The Lord of the Rings is a story,not of metaphysical speculation, but of doing the necessary deed. And the reason for this is that as a story-teller Tolkien takes the side, not of Saruman, the one who would reign in Hell rather than serve in Heaven, but of Gandalf, the one who does not wish for mastery. Saruman will have a certain ending to the story if he can, one in which he alone will reign. He may begin with words about a higher purpose but he will end with tyranny. For we know that Satan’s brave words of defiance are intended for himself alone. He will not share his reign in Hell so as to set us free and the purpose of the rest of us is to help him achieve his freedom at the price of our own enslavement. Soldiers everywhere have a clear sense of priority and Tolkien, drawing on his memories of the trenches of the First World War, knew that well. The sharing of news, unless that news requires immediate action, must always follow after food and some rest. So it is that it is only after they have feasted together and smoked in companionable silence that Merry and Pippin begin to tell the tale of the Fall of Isengard and the revenge of the natural world against the world of the machine. Saruman at first is utterly bewildered by an attack that he never anticipated so it is the bewildered wizard that the hobbits first encounter and they are not impressed. I want to suggest here that Saruman stands as a warning to the West in our own time. As Aragorn says of Saruman, the West was once as great as our fame made us. Our “knowledge was deep” our “thought was subtle” our “hands marvellously skilled”. But we have come to put our trust in the things that we have made and in the armies of slaves who keep us. Our food is grown by workers paid hardly enough to survive, the temples of Mammon in our great cities cleaned by people who disappear into the shadows once their work is done. Meanwhile we fantasise about artificial intelligence and the development of robots and in our right to live as if the whole of creation exists simply in order to serve us. Like Saruman in his speech made to Gandalf when he imprisoned him in Orthanc we “approve the high and ultimate purpose: Knowledge, Rule, Order” believing ourselves to be numbered among the great who must by right be the beneficiaries of this “purpose”. Those who have been reading my Blog that seeks to distil wisdom from The Lord of the Rings will know that I have been reading the text carefully and then reflecting upon what I find there. I happen to think that Tolkien was a man of profound insight. I also think that he was an explorer and that what he discovered in his creation often surprised him. So it is that what we find when we read his work is not a carefully worked out philosophy imposed upon a narrative structure although Tolkien’s Christian faith is a springboard that is absolutely necessary for his explorations. Tolkien genuinely did not know in advance what his characters would do as the story developed. I think that is the reason why it took him so long to write his work. And perhaps one of the reasons why The Lord of the Rings speaks so powerfully to the modern mind is that none of its characters is capable of, or presumes to speak, authoritatively of God or the ultimate mystery of being and of life. You get the impression that Gandalf may know more than most but he does not tell. All that we learn from him is that there is a mystery that gives meaning to all that each character in the story chooses to do. It was back in January 2013 that I wrote about Frodo in the halls of Elrond of Rivendell. At that time I wrote the Blog on my website http://stephenwinter.net/page6.htm#131194 and in that posting wrote about Frodo’s “dream of music that turned into running water, and then suddenly into a voice”. Music is Tolkien’s metaphor for the unfolding of history, one that he unfolds most fully in the first chapter of The Silmarillion, The Music of the Ainur. The Ainur are the angelic beings whose task it is to work with God (Ilúvatar) in the governing of his creation. I do not think therefore that Frodo’s “dream of music” is an accidental detail in the story. He connects for a moment with the Great Music and also with the Great Story for the voice that he hears as he emerges from the dream is Bilbo’s as he chants his own telling of the tale of The Voyage of Eärendil that is chapter 24 of The Silmarillion. Later when he takes the Ring at The Council of Elrond Frodo declares his own Yes to the Music and the Story. He cannot himself control the story to which he says Yes although because he bears the Ring of Power he is tempted to believe that he has the capacity to do this but he is carried by the story and by the music from the moment of choosing until the fulfilment of the choice at the Cracks of Mt Doom. At the ending of one year and the opening of another I wanted to return to this story in Rivendell from my reflections at the ruined gates of Isengard. For we cannot drift aimlessly through life as if there were nothing to be discovered, no commitments to be made. When I started writing this Blog I intended to reflect on composers and writers who I believe to have made a connection to the Great Music and the Great Story and if my readers are interested then I will try to do so next week before returning to Isengard and to Aragorn, Legolas and Gimli as they are reunited with Merry and Pippin. Here I will just say that if 2015 is to be fruitful then it will be because of the commitments we make to the Music and the Story. If we are true to the wisdom of The Lord of the Rings then we will not seek to make authoritative statements about the Mystery but in our own commitments we will seek it out. It is because of his search that Frodo hears the music and the story in the halls of Elrond, that Merry and Pippin meet the Ents in the forest of Fangorn, that Gimli finds understanding in the words of Galadriel and heart breaking beauty in the caves of Aglarond. If we remain true to our own search then we too will find such wonders. You may remind me that I should not forget Frodo and Sam in Shelob’s lair or Merry and Pippin as prisoners of the orcs for if we are true to our Yes then our journey will take us to such places as well but what it will not be is some aimless and meaningless drifting. It will be a true adventure of Joy and Sorrow. We will be men and women who are fully alive. 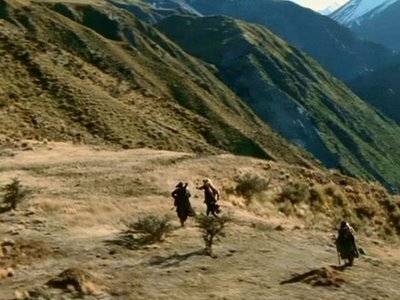 It is some weeks since this blog reflected upon the adventures of Aragorn, Gimli and Legolas, and their pursuit of the captors of Merry and Pippin across the wide plains of Rohan. It has been longer still since we thought about Aragorn’s inner turmoils after the fall of Gandalf; how he was torn between his longing to go to Minas Tirith with Boromir to aid its people in the wars against Mordor and his sense of responsibility to Frodo, the Ringbearer. I wrote about the day when Aragorn ran uselessly here and there as Boromir first tried to sieze the Ring from Frodo and then fell alone in battle trying to protect Merry and Pippin from the orcs of Isengard. The choice that he makes at that moment is one that takes him away, both from the Quest of the Ring and from his longing to fulfill the promise to Boromir to go to Minas Tirith. He chooses to follow Merry and Pippin, the two members of the Company, who, until that point in the story, have contributed least to their task. Any utilitarian assessment of the greatest good at the moment when he makes his choice would tell him that regretably he must abandon Merry and Pippin to their fate and that at least their deaths might be worthwhile if the Ring can be destroyed and Minas Tirith be delivered. But Aragorn is no utilitarian and neither is he a soft-hearted or, might we say, soft-headed sentimentalist. He chooses to trust Frodo’s choice to go on alone knowing that the Council have entrusted him with the task of destroying the Ring. And he cannot go to Minas Tirith having abandoned his comrades. He will follow them even if the pursuit is in vain. In one sense the pursuit, though heroic, is indeed in vain. It is not through his efforts that Merry and Pippin are freed. It is not Aragorn who rouses the Ents to march upon Isengard. At one point Legolas remarks that they have made this great journey to little purpose and as they journey further into Fangorn Forest Gimli is even more blunt. Aragorn has made his choice and once made he will waste no time upon regret. He has done all that needs to be done. We might say that there is some providential link, a synchronicity, between his choice and all the great events that will follow. We might say that if we choose rightly then good things will follow even if we cannot prove a direct link between our choice and the subsequent good. But we cannot prove such a link and Aragorn would not wish to attempt such a proof. He would regard this as an attempt at self-justification and a craven act to which he would never stoop. That is his greatness and the reason why Legolas and Gimli will go with him. And if we would know the peace that Aragorn knows then we too will seek only to make the right choice and then to act upon without regret.